When Danica was little, this is what she said for grandma and grandpa: Amma and Buppa. In truth, we probably liked the names so much that we seized on them right away, and we have been Amma and Buppa ever since. Except . . . 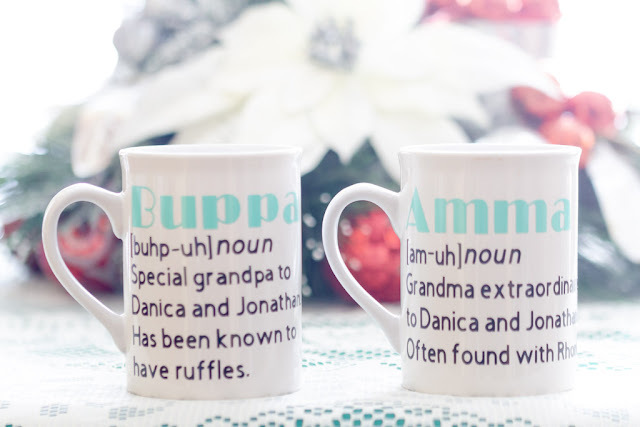 Except Shauna saw someone in our own town, our own little town, advertising Amma and Buppa mugs a little before Christmas. So she surprised us with them on Christmas morning. She had us open them simultaneously, and we are, at this moment, both drinking our morning coffee from said mugs. Buppa [buhp-uh] Special grandpa to Danica and Jonathan. Has been known to have ruffles. Amma [am-uh] Grandma extraordinaire to Danica and Jonathan. Often found with Rhonda. Buppa's Ruffles comes from a time when Danica was very young and brushing my hair, and she called my short hair, on a pattern-bald head, ruffles. Meanwhile, Amma often invokes the help of Rhonda, when flustered. Great mugs! Love the family names! Just delightful dear Amma and Buppa. What a wonderful clip; the back up dancers. Explain the little shop advertising Amma and Buppa mugs a little more though. How wonderful to have those mugs with your favorite names on them. Happy New Year to you both! I am also in mid-60s with 5 gr-kids. We are often called Gpa and Gma. We are both retired teachers. It was really a great experience. This is so sweet! What a lovely surprise it must have been! 'getting mugged' sigh. You with the puns. Lovely! Lucky Amma and Buppa. I called my maternal grandparents Omama and Opapa. Shame they never got a mug!